VOX-Pol researchers took part in the International Studies Association’s (ISA) 60th Annual Convention, which took place from 27 – 30 March, 2019 in Toronto, Canada. 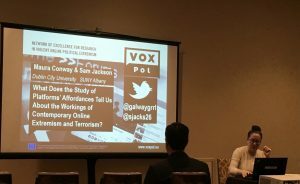 VOX-Pol’s Coordinator, Prof. Maura Conway (Dublin City University),was discussant for the panel ‘Escaping the Stagnation of Terrorism Studies: Innovative Methods, New Findings’ and presented a paper, co-authored with Dr. Sam Jackson (SUNY Albany), entitled ‘What Does the Study of Platforms’ Affordances Tell Us About the Workings of Contemporary Online Extremism and Terrorism?’ Sam, who chaired the panel on which the paper was presented, is an alum of VOX-Pol’s Researcher Mobility Programme. Maura contributed to a round table discussion on ‘Strategic Communication, Persuasion, and Messaging Tactics of Terror Groups: Innovations in a Mass-Mediated World’ at the event too. VOX-Pol’s Dr. Bharath Ganesh (Oxford Internet Institute) also took part in ISA 2019. He presented a paper entitled ‘Audiences of Extreme Speech in the US And UK: The Digital Circuits of White Thymos’ at the Convention.